Sometimes we leave our smartphones behind when we want to grab something quick from a nearby store or run to the kichen to dish out something for the visitors. We thereby leave our unlocked smartphones and personal messages vulnerable to prying eyes. Although, there are apps available on BlackBerry App World that lets you pattern lock or password lock your BlackBerry for a fee, you really do not need an app to do that. 2. Check the box beside Enable to tuen on password lock for your device. 3. Click the Change Password button to set a new password for your BlackBerry. Number of Password Attempts: Here you can set the amount of failed password trials an univited guest would have to perform before they are prevented from trying again. I have mine set on 10. Lock After: This is why I made this article. 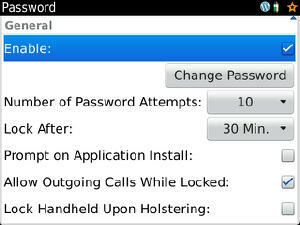 This option will lock your BlackBerry automatically after it has stayed idle for this amount of time. Prompt on Application Install: This option allows you to prevent unauthorized installing of apps by asking for your password before installing an app on your device. Lock Handheld Upon Holstering: This option automatically locks your BlackBerry phone when you put it inside its holster. It will override the “Lock After” option (meaning it locks your phone even if you holster your device before the “Lock After” time). Press the menu button and choose Save when you’re done.